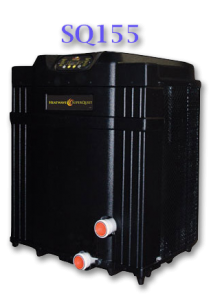 The HeatWave SuperQuiet Series has a Pure Titanium Heat Exchanger at its core and offers you optimum return on your money. ThermoLink™ Heat Exchanger – The primary cause of premature heat pump demise is the failure of the heat exchanger. Ordinary heat exchangers are made from a cupronickel alloy. This cupronickel material is susceptible to attack from the sanitizers used in pools and spas, and from other related water chemistry conditions. Once the heat exchanger fails, the heat pump is ruined. The ThermoLink™ Heat Exchanger tube is made from pure titanium, and is virtually impervious to water-chemistry damage. Scroll™ Compressor – Super efficient, heavy-duty and quiet operation. Microprocessor Computer Controls with Digital Thermostat – Consumer friendly technology instantly provides total comfort control using large easy-to-view digital L.E.D. status readouts and water resistant keypad, combined with a state-of-the-art microprocessor and dual thermostats. Corrosion Proof Cabinet – UV treated high-impact plastic cabinet is impervious to deterioration with an easy access panel for cleaning and servicing. Rust proof, fade proof and crack resistant. Off-Set Plumbing – For easy installation. The newest edition to the HeatWave SuperQuiet line is the SQ175. 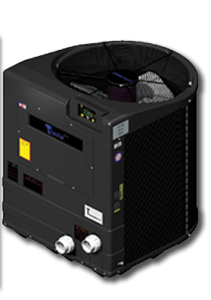 The SQ175 is our biggest heat pump ever and carries all the standard HeatWave SuperQuiet features but with higher BTUs and COPs. Designed for residential and commercial pools with large surface areas. The HeatWave SuperQuiet SQ155 comes packed with all standard features. Our patented counter-flow water management system heats water faster and more efficiently. Comes standard with a limited lifetime warranty that keeps you stress-free for the life of the heat pump. HeatWave SuperQuiet SQ155 is a sure-fit for your swimming pool. Designed for residential and commercial pools with large surface areas. Works great for smaller pools where over sizing is desired. The HeatWave SuperQuiet SQ120 comes packed with all standard features. Our patented counter-flow water management system heats water faster and more efficiently. Chemical corrosion is not a factor with our impervious materials. That’s what we like to call “durability without sacrificing efficiency”. Designed for residential and light-duty commercial pools. Works great for smaller pools where over sizing is desired.